Forty-five minutes of supercharged circus performance and wild poetry in motion, directed by the dynamic duo Pépin and Nina. The great feat is in itself the dramatic energy of the show, constantly and mercilessly swinging back and forth between Pépin’s quiet calm and Nina’s explosive extravagance. Their love of dance, rhythm and laughter is what ties them together the most. They juggle, twirl around and fly through the air on the trapeze with humour and infectious delight. They dive joyfully into their frenzied dreams and live passionately… They give everything they’ve got to share all of these intense emotions with their public. Circus technics : juggling, pair acrobatic feats and dances, swinging trapeze and passing acts. 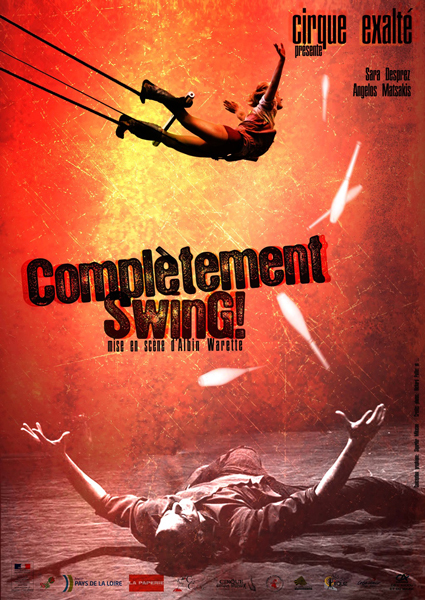 “Completely Swing!” is performed in the street, beneath the company’s portico, or under the big top. Artistic Direction : Albin Warette // Technical Support : Alexandre Maladry. Set design : Thierry Deschamps, Jean-Claude Furet, Didier Ledus. Costumes : Agnès Vitour & Sara Desprez.